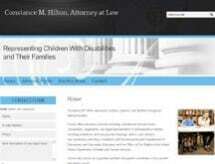 Constance M. Hilton specializes in the representation of children with disabilities and their families in special education cases and other school related matters. Connie is also available to serve as a guardian ad litem or family co-coordinator in probate court and juvenile court matters. Connie previously served as a hearing officer for the Bureau of Special Education Appeals (BSEA) and as Deputy General Counsel for the Office for Children (OFC) before entering private practice over twenty years ago. She was previously the co-chair of the Special Education Parents’ Advisory Committee for Cambridge, a board member for the Cambridge Guidance Center, a member of the Cambridge Kids’ Council, and a board member for the Child Care Resource Center. Connie was a founding member of the Cambridge Women’s Commission. She is a frequent speaker at conferences and workshops for parents and advocates as well as for legal professionals and mental health professionals. Connie is a member of the Council of Parent Attorneys and Advocates (COPAA), the Massachusetts Association of Guardians ad Litems (MAGAL), and the Special Needs Advocacy Network (SPaN). Connie graduated from the University of Illinois and Suffolk University Law School. She is the parent of two children.